Marwa Helal is the author of Invasive Species (Nightboat Books, 2019) and the winner of BOMB Magazine’s Biennial 2016 Poetry Contest. She has been awarded fellowships from Poets House, Brooklyn Poets, and Cave Canem. Cynthia Cruz is the author of five collections of poetry: How the End Begins; Wunderkammer; The Glimmering Room; Ruin; and Dregs (Four Way Books, September 2018). Lincoln Michel is the author of Upright Beasts, a collection of short stories (Coffee House Press, 2015) and the co-editor of the anthology Tiny Crimes (Black Balloon Press, 2018). His fiction and criticism appear in The Paris Review, The New York Times, BOMB, NOON, The Believer, and elsewhere. His story “What the Landlord Knows” from Issue 42 can be read on our website here. These wonderful authors make up just a small part of the long list of established and emerging writers who contributed to Issue 42 of Washington Square Review, which is now available to purchase on our website. Copies of the issue will also be on sale at the launch party! 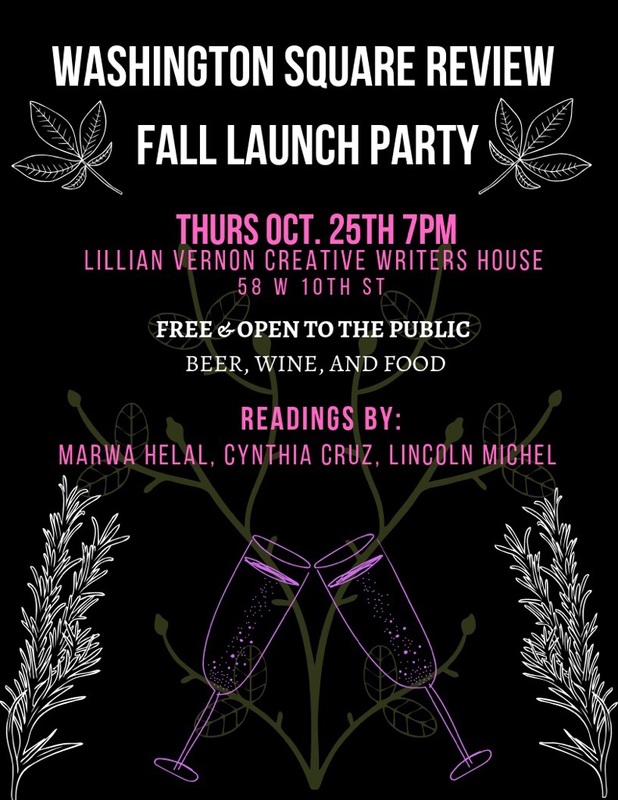 Please join us for a night of celebrating new and exciting literature! Bring your friends, bring your friends’ friends, bring your mother and your mother-in-law. Beer. Wine. Food. Poems. Stories. If any of those things interest you, and you’d like to let us know you’re coming, you can do so on our event page!